The Organization's no. II and one of the six apprentices of Ansem the Wise. Join now. This awesome, easygoing sniper needs more love! btw, we're not really affiliated with these two, but it's best we post them anyway. (offsite) got a dA account? Join the Xigbar FC/#TheFreeShooter-II on dA! Nice to meet another Xigbar fan any topic to discuss for Xigbar? Haha, I remember those reports! Hilarious stuff. Xigbar, and of course Braig, are very good villains. What's the best thing about Xigbar/Briag. The way he acts laidback and clueless when he really knows more than anyone would think. Xigbar thinks it's totally cool you support him. To show how much we appreciate it, take a plushie! MX helped a bit, but yeah, Braig played a huge role in planning everything. In fact he's the reason it worked out. It seems like he's the one who got Xehanort to start researching the Heartless, at least from what I've seen of the secret ending. How is he the mastermind when everything has already been laid out before him? Braig is, well, a weak character (the fact he only seems to follow other's plans, he can't seem make his own. And he'll do anything for power). He didn't have to tell Terranort about the Heartless. But he did, because he still wanted a keyblade. Xigbar stuck with Xemnas for years because of this. Even though Xemnas was going to screw him over along with the rest of them anyway. But yes! I have a reason for your club. Braig knows how to make an exit. Look at him hop away! Also, can I join please? He's my all time favourite. A few problems with your statement. 1. Braig never showed the desire to have a Keyblade. If you're talking about MX's side of their deal, that was to enhance Braig's darkness. Notice how his eyes changed from brown (when he fought Terra) to yellow (when he fought Aqua). 2. Braig/Xigbar isn't a weak villain really. He has his own plans. For example, he knew Kingdom Hearts would reject Xemnas, but didn't tell him. Why? Because he had some sort of secret plan. And as far as powers goes, he's powerful as a human and Nobody. The only strength he gains as a Nobody is the ability to manipulate space. 1. I did notice the changes. They're pretty hard not to miss lol. Braig does express the want for a keyblade. He says so. "When I asked about it, it just sounded so cool. I couldn’t help but want one too"
"Which means if I kill you the keyblade’ll suit me just fine. It’s kinda a messy way to get things done but there’s no way out of it"
But as you've said there, this could just be a cover up for Braig's real want to have darkness (this is what you were saying, yeah? ), but I'm not too sure about that. All we know is Braig's side of the deal, and not MX's, so it really could be either. When did Xigbar make his own plan...? He didn't know what Xemnas was planning, no one did. (Only Xion but I don't know how she figured that out.) Can you tell me where you got his from? I'm just wondering because I've never seen anything that hints towards this. Unless I've been seriously dense .___. The gears of Xemnas' plans have begun to spin wild since the loss of half our membership at Castle Oblivion. The results are there, but can this state of affairs fairly be called a success? If Kingdom Hearts can be said to possess a mind of its own, it is surely rejecting Xemnas - no, rejecting Xehanort. Roxas left the Organization today. This is a quote from the secret report, a series of reports written by members of the Org. Xigbar wrote this on Day 355. And yet Xigbar never mentioned this to Xemnas? Hmmm...seems like someone had his own plans in store. 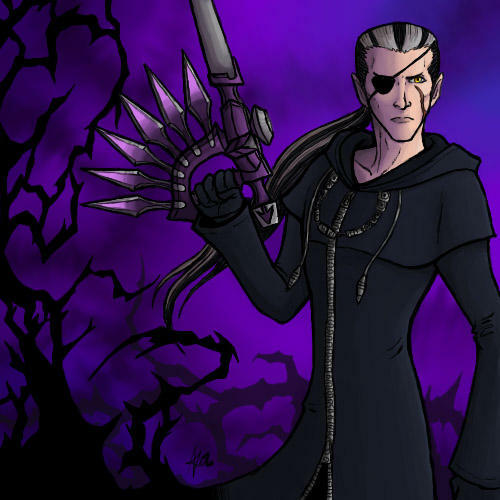 Xigbar knows that Kingdom Hearts is rejecting Xemnas. He doesn't know what Xemnas really wanted to do with it. Xigbar is stating there what's really happening, since Xemnas is rejecting the impending failure of his plan. Xigbar doesn't have a plan. If he did, why didn't he do something instead of sitting there doing nothing? Why didn't the game hint more towards this? And who would help him with it? ...Demyx? We saw that Axel and Saix had their own plan, we got hints of this. But none from Xigbar. In fact, he's one of the (rare) loyal members. Yeah, he spys on Xemnas, but this is simply because he has nothing better to do with his time. As for keeping this information to himself, why would he bother to tell anyway? He doesn't like Xemnas too much, and Xemnas wouldn't even listen to him. Fair enough. I guess Xiggy never did have original plans. But for a lackey, he's still pretty good. Mind if I join. Xigbar is awesome.